Not only is March Women’s History Month, but March 8th is International Women’s Day. While women have made progress at work, in education, and in leadership, women still face a frustratingly stagnant wage gap and, as recent news makes clear, still experience pervasive harassment at work. If current trends continue, it will take 41 years—or until 2059—for women to finally reach pay parity with men. For women of color, the rate of progress is even slower. Hispanic women will have to wait until 2233—216 years from now—and Black women will wait until 2124 for equal pay. The last decade saw the slowest growth in women’s wages in nearly forty years. 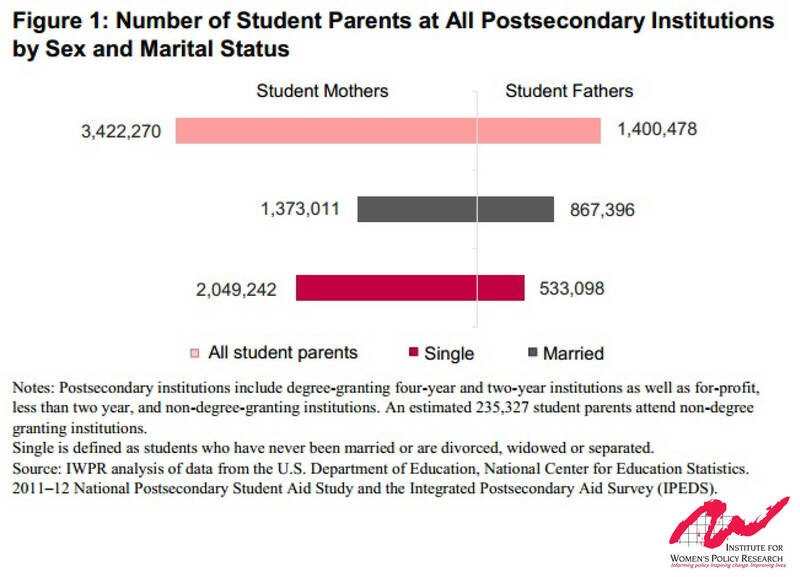 The number of single mothers in college more than doubled in 12 school years between 1999 and 2012, to reach nearly 2.1 million students—or 11 percent of all undergraduates. Women of color in college are especially likely to be single parents: nearly two in five Black women (37 percent) and over one-quarter of American Indian/Alaska Native women (27 percent) are raising a child on their own while in college, more than twice the rate of White women (14 percent). At the same time, access to child care on campus declined in most states and student parent enrollment in for-profit colleges grew by a staggering 138 percent, the most dramatic increase among all institution types. Student parents are more likely to have lower incomes and less likely to graduate than their non-parenting peers. Intimate partner violence (IPV), sexual assault, and stalking have profound economic effects on victims and survivors, outlined in an IWPR fact sheet, which summarizes findings from research literature on the economic consequences and costs of violence against women. In addition to physical harm, survivors and victims often must contend with high medical expenses, lower wages from diminished educational attainment, lost wages from missed work and job loss, debt and poor credit, and costs associated with housing instability. 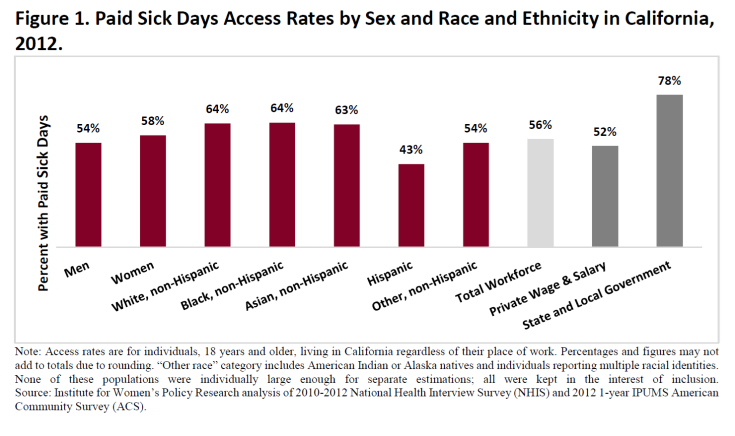 A decade after the Great Recession, a slow and uneven recovery has left young women of color behind. In 2016, Black women aged 25-34, experienced an unemployment rate of 8.8 percent, which was higher than the peak rate experienced by White women of the same age in 2010 (7.7 percent). For younger women, the disparity is even wider. “Youth unemployment is a critical issue because prolonged unemployment in the years following high school or college graduation means lost wages and lost opportunities to gain work experience, develop occupational skills, and cultivate a professional network,” IWPR President Heidi Hartmann, Ph.D., said about the analysis last year. Unionized women earn $219 more per week, or 30 percent more, than non-unionized women, according to a new analysis by IWPR. In addition, union membership may also help women secure health insurance: About 51 percent of women who are not in unions have employer-provided health insurance coverage, compared with about 77 percent of women in unions. 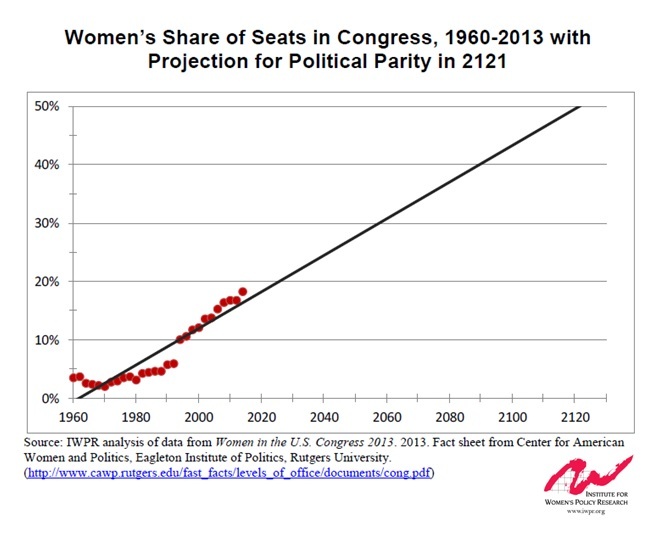 IWPR will continue to #PressforProgress by producing reliable research and analysis that advances the status of women. Join us by connecting with us on social media (Twitter, Facebook, Instagram, or LinkedIn) or signing up to receive our email newsletters. The 79 percent wage ratio figure, the most commonly used figure to measure the gender wage gap in the United States, is often derided as misleading, a myth, or worst of all, a lie. In this blog, we argue that the figure is an accurate measure of the inequality in earnings between women and men who work full-time, year-round in the labor market and reflects a number of different factors: discrimination in pay, recruitment, job assignment, and promotion; lower earnings in occupations mainly done by women; and women’s disproportionate share of time spent on family care, including that they—rather than fathers—still tend to be the ones to take more time off work when families have children. 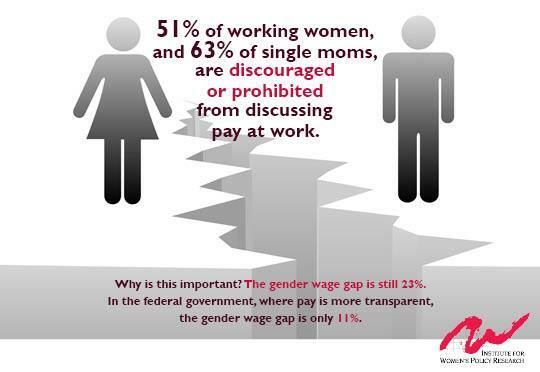 Just because the explanation of the gender wage gap is multi-faceted does not make it a lie. Every September, the U.S. Census Bureau releases its update on income and poverty in the United States. I—along with many other economists, policy wonks, data geeks, and others—impatiently refresh the Census.gov website to learn whether there has been any improvement in men’s and women’s earnings, the wage gap, or the poverty rate. In recent years, the significance of each release has been characterized by its insignificance: since 2007, there has not been a statistically significant narrowing of the gender wage gap, and between 2013 and 2014, there was not a statistically significant difference in the poverty rate. 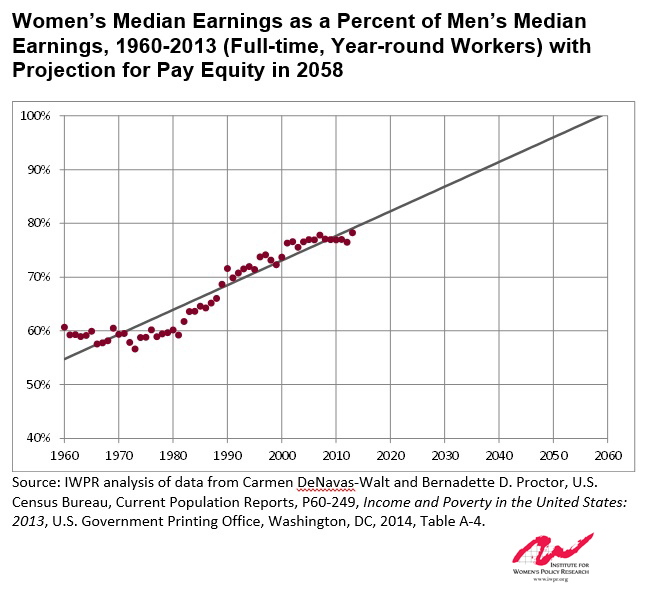 Moreover, adjusted for inflation, the last ten years have seen virtually no increase in women’s earnings, so women are now experiencing what men have experienced for more than three decades—the failure of real wages to grow. According to the new Census data, women now earn 79 cents for every dollar a man earns for full-time, year-round work; actually that’s 78.6 cents compared with a new estimate for the prior year of 78.3 cents, a small gain indeed. The gap is even wider for most women of color, with Black women earning only 59.8 cents on the white man’s dollar, and Hispanic women only 54.6 cents on the white man’s dollar. By projecting the rate of progress from 1960 forward, the Institute for Women’s Policy Research (IWPR) has found that women will not see equal pay until 2059, one year longer than IWPR’s previous projection. As a clever segment on The Daily Show noted, wage equality for women will take longer to achieve than flying cars or 3D-printed human organs. For an economy that left the Great Recession behind six years ago, this stagnation is beyond frustrating. Such a wide gap has compound effects over a woman’s lifetime: the typical woman will lose $530,000 over the course of her lifetime due to the wage gap; a college educated woman will lose $800,000. For an individual woman, this is an incredible, undeserved reduction in her lifetime earnings, compromising her ability to save for assets like a house or retirement fund or simply to make ends meet. For families, the gender wage gap can make the difference between living below or above the poverty line, having funds for recreation and vacations or having none, having access to high-quality child care, schools, and colleges, or only being able to afford poorer quality alternatives or no pre-kindergarten or post-secondary education at all. For the economy overall, unequal pay is holding back economic growth. IWPR estimates that nearly 60 percent of women would gain pay if they were paid the same as men with similar qualifications and hours of work. Added across the U.S. economy, these gains amount to 2.9 percent of GDP, a growth rate equivalent to adding another state the size of Virginia. 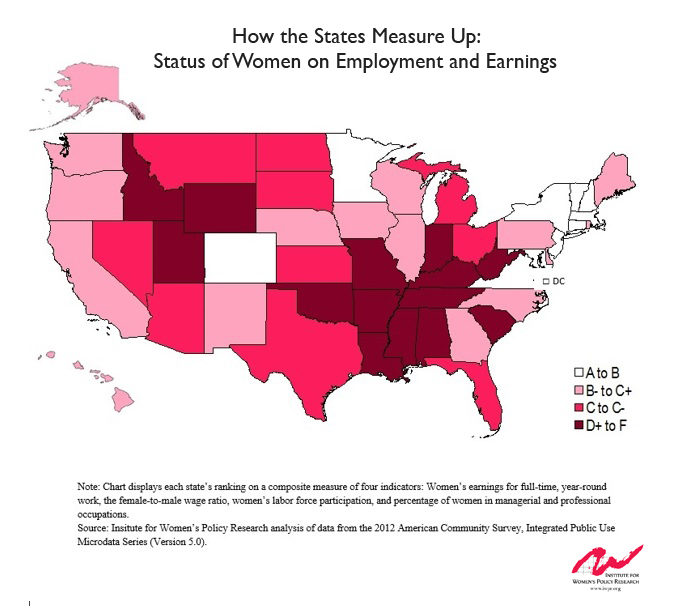 (This type of estimate assumes, of course, that, because of discrimination and other factors, women are currently paid below the level of their productivity; it also assumes no change in women’s education or work hours, which would surely increase if women could expect to earn equal pay.) 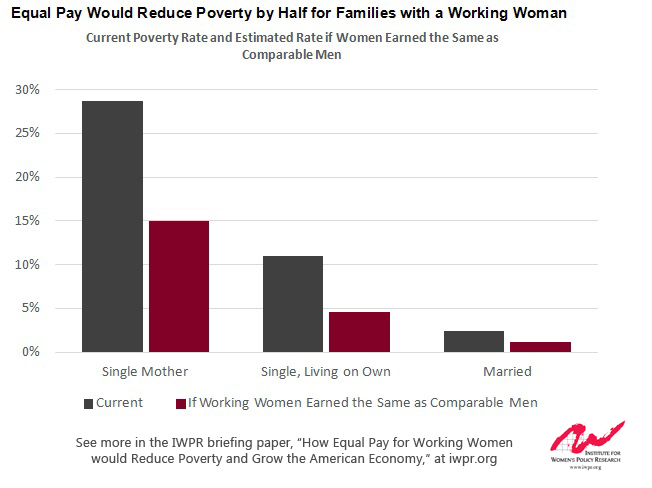 Each woman, including those who would gain nothing, would earn $6,251 more annually on average, reducing poverty by half for all families with a working woman as well as working women who live alone. But ensuring that women receive equal pay is not as easy as just paying women more for their work (though that would be a good start!). Businesses and policymakers both have a role to play to achieve the benefits of equal pay well before 2059. You can read my recommendations for how private and public policies can narrow, and eventually eliminate, the gender wage gap over at Fortune. (Hint: we need to address wage inequality by bringing up the bottom of the pay scale, and we also need to close the gender care gap.) It’s time we start taking achieving equal pay seriously.